Crepes are one of my favorite things to make. They’re something so simple but can deliver pretty complex flavors when done well. They’re versatile enough to eat for every single meal of the day. From sweet crepes for breakfast or brunch to savory crepes for dinner, you can do pretty much anything you want with them. 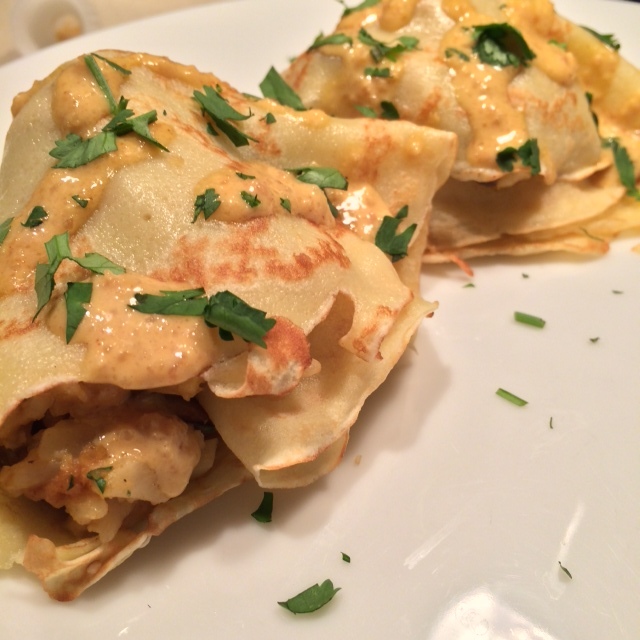 I learned how to make crepes in a class at The Chopping Block about a year and a half ago. The trickiest thing to get right is getting the batter to cover the entire bottom of the pan and not using too much batter because crepes are supposed to be extremely thin. I stumbled quite a bit trying to get the technique of swirling the pan with my left hand while ladling in the batter with my right hand. If you’ve ever tried rubbing your belly and patting your head at the same time, that’s how awkward it was for me. Eventually I got it down well enough that I moved on to trying to flip the crepe by just using the pan. Another step in which more than a few crepes suffered from poor technique. I also turned to none other than the master Jacques Pepin for some tips on making crepes. Of course he makes it look as simple as making a peanut butter and jelly sandwich, but that’s why he is the master. I built this recipe knowing that I was going to try a new peanut sauce that I’ve had bookmarked for a while. With peanut sauce as the main driver, I figured Asian would be the best way to go, so what better than to make a simple stir fry to fill the crepes with. Once I had that in mind, I immediately went to thinking about how I would plate the dish. Sometimes I make decisions on what to cook by starting with the type of presentation I want to do. Is that weird? Maybe, maybe not. Either way, presentation can really amplify a dish, so I’ve always got that in mind. Five weeks into the baking and pastry course and I’m super-ready to move on to the savory side. You’ll notice that I didn’t post a “week five” of culinary school because I’m kinda sort of over pastry. However, I really did enjoy the kudos doled out by my colleagues when I brought in the devil’s food cake with coconut-vanilla buttercream frosting. Yep, that was pretty good – I even had a small piece. This weekend, I was really ready to get back to cooking what I love the most – savory foods. 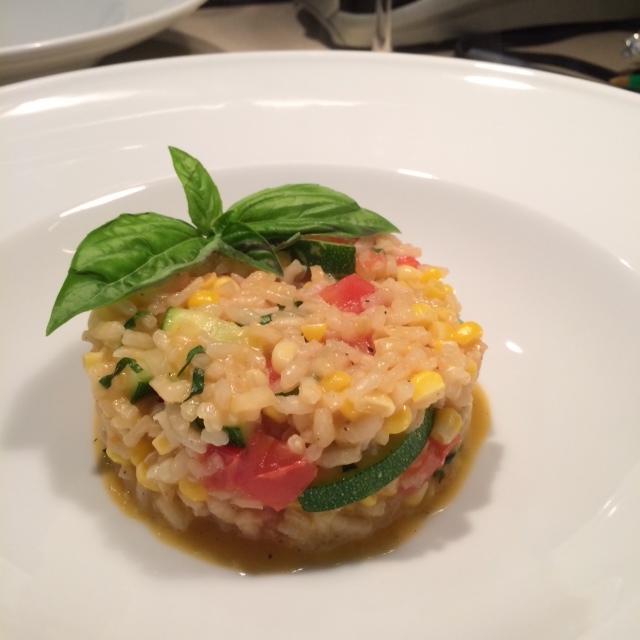 And what better to make than a season-appropriate risotto? I was anxious to try the Arborio rice I picked up from Eataly a couple weeks ago and this seemed the perfect opportunity to take advantage of it. 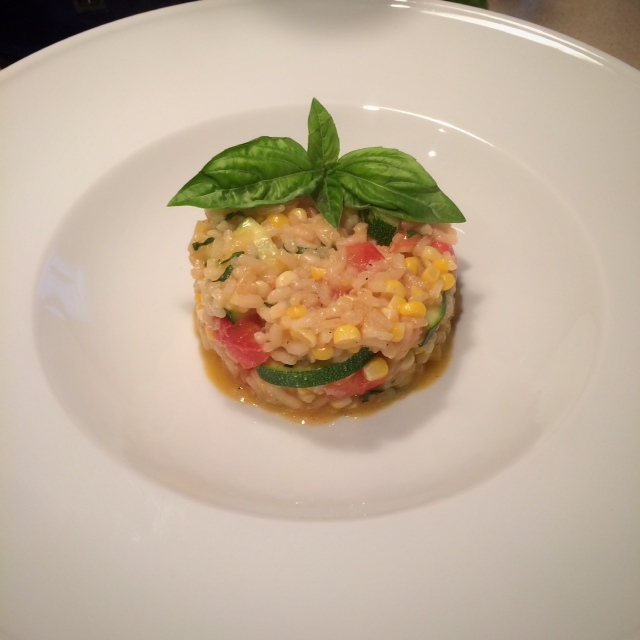 I love risotto because you can pretty much do anything with it. There are ingredients that will work with every season of eating and it’s a hearty dish, that when made well, can even work as a light summer dinner. Tonight’s recipe is no exception. Everything that went into this one was acquired at the local farmer’s market and was super delish. Risotto can’t be rushed, so make sure you allow yourself at least 30 minutes cooking time (more to prep your ingredients) to pull this together. It will be well worth the time investment! Bring broth to a boil in a small saucepan. Reduce heat to low and keep hot. In a large skillet, melt butter over medium heat then add shallot and garlilc, season with salt and pepper, and then saute until tender, about 3 minutes. Add rice then stir to coat in butter. Add wine then stir until nearly absorbed by rice. Add 1/2 cup chicken broth then stir constantly until broth is absorbed. Continue adding broth, 1/2 cup at a time, stirring constantly until nearly absorbed before adding more. When there’s 1/3 of the broth remaining, add zucchini, season with more salt and pepper, then continue stirring. When there’s 1/4 of the broth left, add corn then continue stirring. Add the tomatoes with the last batch of broth then stir until absorbed. Take risotto off heat then stir in parmesan cheese and basil. Add more salt & pepper to taste then serve. Garnish with whole basil leaves, if desired. Hello, summer. 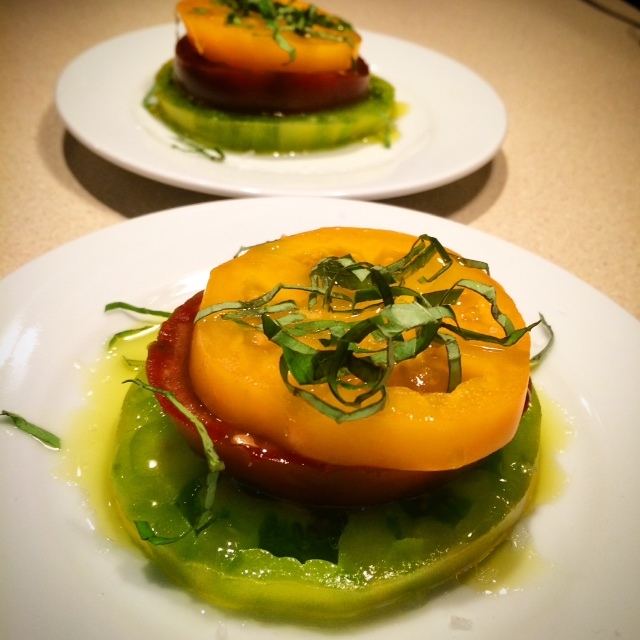 Hello, summer heirloom tomatoes and your delicious, beautifully colored, lumpy shaped form. Is there any better fruit (yeah, fruit) than the fresh, summer tomato? I think not. I just finished reading Tomatoland and learned way more than I ever intended about the tomato industry. Tomato agriculture actually has quite a sad and shocking history. Ever had a bright, red tomato in the dead of winter? Chances are that tomato was harvested by a slave. Modern-day slavery is alive and well in many produce industries, but none more than what was depicted in this book in the Florida tomato agriculture. Thankfully, steps have been taken to abolish slave labor and provide better wages and housing for farm workers, and that story is well documented in the book. But there’s still a long way to go. Also well-documented in the book is the stringent checklist of attributes a tomato must possess to be deemed worthy by the Florida Tomato Committee, none of which is taste. Is the fruit the right shape? Check. Is it the right size? Check. Is the fruit the right color? Check. (By the way, nearly all tomatoes are picked when they’re green and then stored in a warehouse where they’re treated with ethylene gas to give them the red color we’ve come to cherish. Exception being organic tomatoes.) Has optimal taste been ensured? Um…uhhh…. No. The answer is no. Taste is almost never a factor in the cultivation of tomatoes. Ever had a mealy, bland tomato? I bet it looked beautiful because it passed all the other points on the checklist. The kitchen is back up and running after taking a little break from cooking the last week or so. Terry had gum surgery, which pretty much left her diet limited to yogurt and anything else that requires little to no chewing. Then Charlie had his teeth cleaned and had a couple benign fatty tumors removed. Needless to say, there has not been a lot of appetite to go around lately. Since everyone’s feeling better today I pulled out this recipe that I found a while ago. I made a few modifications that I think made it even better. 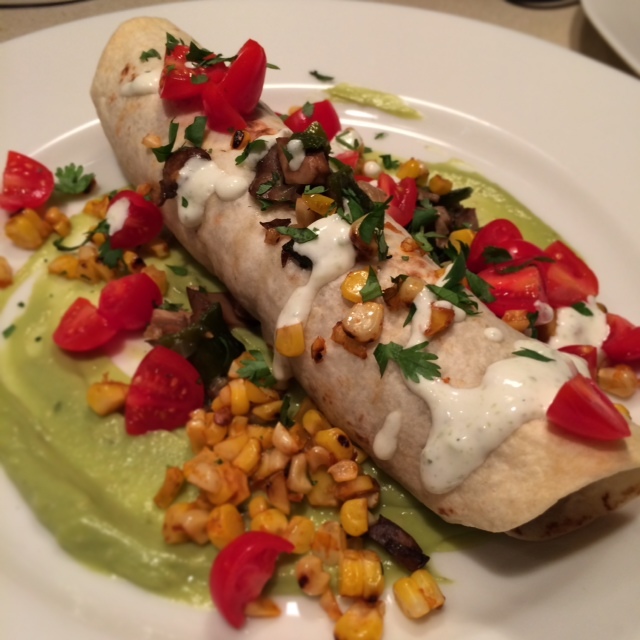 If you wish to keep it vegan, you can follow the original recipe or just skip the jalapeno cream. I’ve never had a cashew-based sauce, but I bet it’s probably not too bad. I’ll put that on the list of things to try another day. This was goooo-oood. The corn adds a little more color and pop of smoky flavor to the mix. You’ll definitely get a couple different types of heat, but they’re not so overwhelming that you can’t taste the freshness of each of the vegetables. You can have fun with the presentation, too. I put the avocado sauce down first and layered everything up from there. 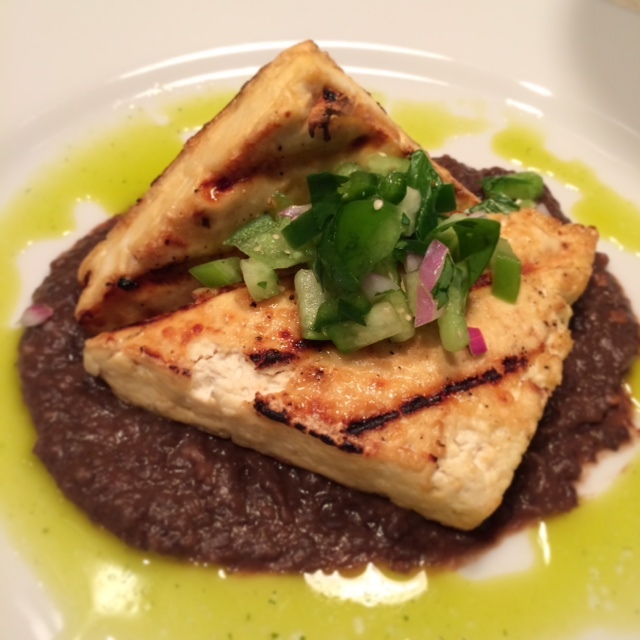 Today I was inspired by a leftover ingredient from last week’s ancho-honey glazed tofu steaks. I have a whole can of chilies in adobo sauce to use before they go bad, so I based this entire dish on using the leftover sauce. I thought it might be fun to try a southwestern/Italian fusion dinner. Lots of southwestern dishes use rice as the base, so I chose risotto. Plus, it was a great excuse to grill corn, even if it is a little premature for the season. I lucked out today because the corn I picked up was totally awesome and flavorful. Roasting the peppers over an open fire in the kitchen was pretty fun, too. At first I was just going to use the adobo sauce as-is, but it packs a lot of heat that I didn’t want to over-power the rest of the flavors. Enter the trusty Greek yogurt. That worked well because risotto dishes are often finished with cream, so this was going to do the trick just fine. Ever since we got back from Vegas, I’ve had a dish I ate at Mesa Grill on my mind. I’ve been dying to try cooking it so this weekend seemed like as good a time as any! Especially since it was the perfect excuse to clean up the grill and put it to use for the first time this season. This version is hardly complete, I’m missing two of the sauces (roasted red pepper and jalepeño crema), but the flavors were still really good. If you don’t want to fire up the grill, you could use a grill pan or broil the tofu. I’m definitely making this one again – it’s got a lot going on, but it’s totally worth it! Combine ingredients for the bean sauce in a food processor and blend until smooth and well combined. Transfer bean mixture to a saucepan, add salt and pepper and heat on a low flame, about 8-10 minutes or until warm. Be careful to not let it burn! Slice the tofu into two equal pieces and set over paper towels to drain the water. Coat the tofu steaks with the vegetable oil and season each side with salt and pepper. Place on the hot grill and cook on each side for about 2 minutes. After each side has been cooked, brush the glaze on the steaks and cook an additional 2-3 minutes each side. To make the salsa, chop all of the ingredients, mix in a bowl and coat with the lime juice. This can be done ahead of time and can be stored in the fridge. 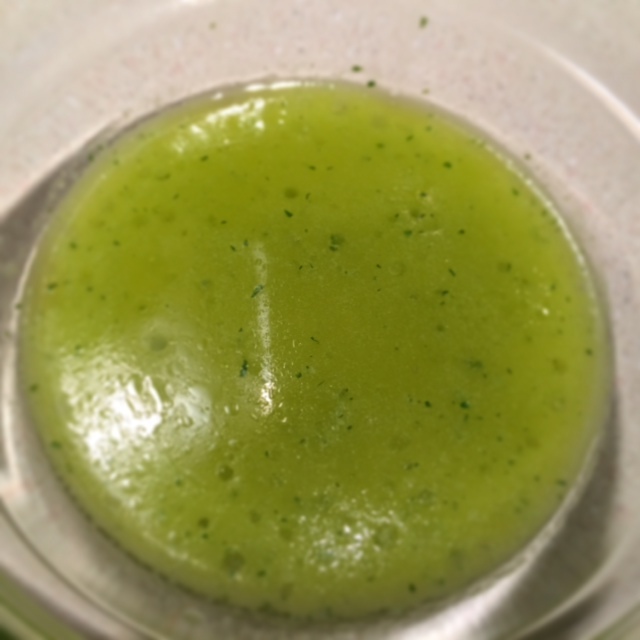 To make the cilantro oil, combine all ingredients in a food processor or blender and mix until well combined. Strain mixture through a sieve, discarding any cilantro leaves that are left behind. Plate the dish by spreading the black bean sauce on the plate, then the tofu steak. Top with the tomatillo salsa and drizzle the cilantro oil around everything.